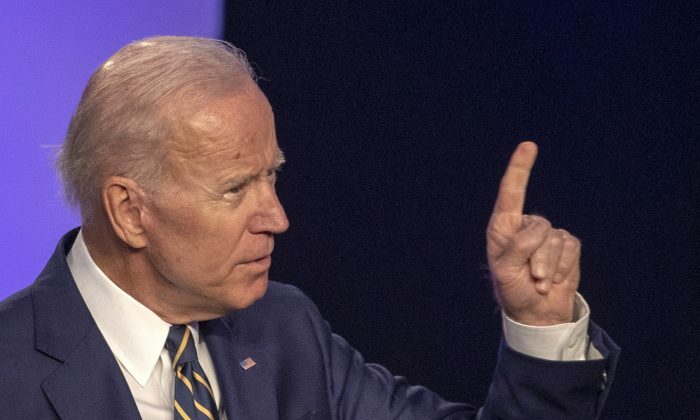 Former Vice President Joe Biden didn’t mention or endorse the socialist Green New Deal and Medicare for All policies during a speech to an electrical workers union conference in Washington on April 5. Biden, who has told supporters he’s running for president but hasn’t officially declared his candidacy, discussed both health care and climate change in the speech to the International Brotherhood of Electrical Workers conference. But the former vice president, who leads the Democratic field in early polling, made no mention of the Green New Deal and Medicare for All, the two socialist policies endorsed by virtually every Democratic presidential contender. Biden celebrated the passage of Obamacare, claiming that it gave “peace of mind” to 22 million Americans. But he stopped short of mentioning or endorsing Medicare for All, the socialist policy endorsed by the rest of the Democratic field. Biden also discussed climate change. He appeared to suggest, without evidence, that human activity such as the burning of fossil fuels caused the recent flooding in Nebraska that inundated a U.S. Strategic Command Air Force base. “We have to prepare. But it will create jobs, make us stronger,” he added. Biden’s statements fell far short of the vision cast in the Green New Deal resolution, which calls for the elimination of all gas-engine cars, the upgrading or replacement of every building in America for energy efficiency, and the complete transition away from fossil fuels. 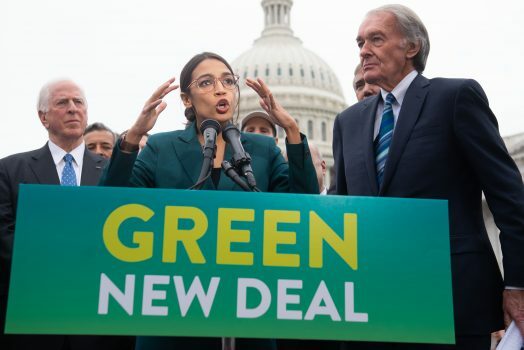 The Green New Deal was introduced in the House by Democratic socialist Rep. Alexandria Ocasio-Cortez (D-N.Y.); the Communist Party USA and the Democratic Socialists of America both support the policy. The policy would cost $650,000 per U.S. household over the course of a decade, according to one estimate. Biden’s position on both Medicare for All and the Green New Deal is significant because the campaign of President Donald Trump has cast the 2020 election as a choice between socialism and freedom. Endorsing the two socialist policies would give Biden a vital boost among the Democratic base for the primary election, but is sure to lose him general election votes from average Americans, the vast majority of whom view socialism in a negative light. While providing health coverage to an additional 22 million Americans, Obamacare failed spectacularly for the rest of the nation. Premiums rose nationwide and billions of dollars were wasted on failed state exchanges, with private insurers fleeing some states entirely, among other issues. While Obamacare was a significant step toward socializing the health care industry, Medicare for All is a purely socialist policy, with marginal exceptions such as insurance for plastic surgery. The list of reasons for Obamacare’s failure is long, even by the accounts of left-leaning editorial boards, including the Chicago Tribune. At its core, Obamacare is a fundamentally socialist policy that straitjackets the free market. Medicare for All would eliminate the free market in the health care industry entirely, handing the government a near-total monopoly. Biden’s failure to endorse Medicare for All indicates that he may choose to steer his platform away from the hard-left rush of the Democrats who have already declared their candidacies. Self-declared socialist Sen. Bernie Sanders (I-Vt.) has been pushing Medicare for All for several years. In 2013, his bill had no co-sponsors. In 2018, one in three of Senate Democrats and two in three House Democrats signed on to the legislation. Medicare for All may cost up to $32 trillion over the course of 10 years, more than half of the entire projected spending of the U.S. government. Every Democratic candidate for president polling at above 1 percent has endorsed Medicare for All. While it is unclear what Biden’s stance on the policy is, he will likely have to reveal it shortly after announcing his candidacy.